Asked to comment on Karuna’s claim that Prabhakaran’s wife Mathivathani and daughter Thurka were killed in shelling, Fonseka said that he had no information. 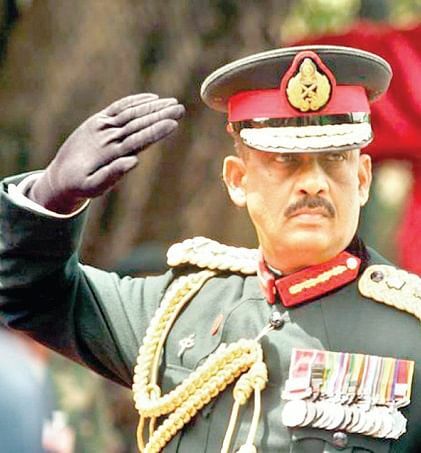 COLOMBO: Field Marshal Sarath Fonseka, who commanded the Sri Lanka Army during the 2006-2009 Eelam War IV, has refuted the contention of former Tamil Tiger commander “Col” Karuna Amman, that Tiger Supremo Velupillai Prabhakaran had shot himself dead and was not killed by Lankan troops as claimed. “He had a head injury in which a part of the skull had come off. If he had shot himself, the bullet would have come out from the other side of the head. But this had not happened. He might have been hit by shrapnel from a mortar bomb or a shell,” Fonseka told Express here on Monday. Asked if a post mortem was done on Prabhakaran’s body, Fonseka said that the police did a post mortem as per law, and a DNA test was also conducted to establish his identity. Asked to comment on Karuna’s claim that Prabhakaran’s wife Mathivathani and daughter Thurka were killed in shelling, Fonseka said that he had no information. He has no clue as to what happened to Prabhakaran’s second son, 12 year old Balachandran either, though some TV channels showed the boy in captivity. “Armies do not identify all bodies after a battle. We were looking for Prabhakaran’s elder son, Charles Anthony, and his body was found and identified,” Fonseka said. Ranil Wijayapala, reporter for Colombo-based ‘Sunday Observer’, who was present at the time the body was identified, said that there was only one injury in the body and that was in the head.